Part 2 of a two-part series. Read part one here. Bluetooth low energy squarely targets the market for wearable technology and Internet of Things (IoT) devices. The constraints of size, cost, and battery life in these devices make it fundamentally more difficult to achieve good RF performance. However, new, over-the-air (OTA) testing systems can help product developers navigate design challenges and deliver reliable performance. The importance of wireless performance, to these products, requires that OTA testing be implemented as part of the design verification and manufacturing processes. This article will look at the testing challenges, exploring new test methods that help deliver reliable RF connectivity. As with other products that depend on wireless connectivity, high reliability is critical to Bluetooth low energy-based electronics. This is true for devices used in both consumer and mission-critical applications, such as medical devices. In this era of online reviews, even a few failures can sink a consumer product. If the initial online reviews indicate DOAs, early failures, or unhappy customers, it is unlikely that sales will recover. Brand damage can even extend to the manufacturer or the distributor, and legal liability is possible in mission-critical applications. Good design, development, and product testing are key to ensuring functionality, reliability, and continued sales growth. Testing is an important consideration through a product’s entire life cycle in order to find and fix problems before they become truly expensive. Fig. 1 shows the relative cost of finding and fixing faults at different stages of product development and manufacture. Note that the cost increases exponentially as a company progresses deeper into the product lifecycle. Bluetooth low energy, as defined in the Bluetooth 4.x specification, is a specialized version of Bluetooth specifically designed for low data rate, long battery life applications. Bluetooth low energy uses fewer channels, spaced further apart, than classic Bluetooth, helping to simplify the design and lower the overall device cost. Although designed for low data rate applications, Bluetooth low energy can achieve speeds up to 1 Mbps in bursts, and higher data rates are planned for future Bluetooth releases. Maximum transmit power is limited to 10 mW for short-range applications, although higher output power and coding changes are planned, which will extend the usable range to tens of meters. The Bluetooth 4.x standard for Bluetooth low energy imposes mandatory testing requirements on vendors before they may use the Bluetooth logo. The standard includes a predefined test mode that uses a direct, non-link connection that bypasses the software stack and concentrates on hardware testing. This non-link method uses low-level control of the device and provides a repeatable test method. However, critical elements of the device are not well-characterized with non-link testing, and this method alone is not sufficient to ensure a good customer experience. Transmitter Test – At normal and extreme operating conditions (NOC and EOC, respectively), the device must be capable of transmitting specific test data patterns, and the test equipment will verify characteristics such as output power, in-band emissions, modulation characteristics, carrier frequency offset, and drift. Receiver Test – At NOC and EOC, the test equipment will transmit intentionally distorted “dirty packets” to verify receiver sensitivity, carrier-to-interference (C/I) ratio, blocking and intermodulation performance, maximum input signal level, and Packet Erro Rate PER report integrity. Conducted RF – The test specifies to use conducted RF (a cable), rather than radiated RF testing that would validate the antenna performance and the effect of antenna performance on overall design. Bluetooth low energy devices use highly integrated designs, and the antenna is a critical element that needs to be included as part of a complete test process. OTA radiated testing is necessary to ensure a more realistic characterization of actual performance. Test Mode Firmware – To perform the standard tests, the device must be in a special test mode that does not use the final Bluetooth software stack. The software stack controls the RF differently than test mode, and we have seen many devices that perform well in test mode but do not behave as expected, or within spec, when running the final software stack. Test mode can provide a misleading indication of actual RF performance, and is therefore insufficient to determine how the device will perform in actual customer applications. External DUT Control – To control these special test modes, an external connection to the device is necessary for sending test commands. Many Bluetooth low energy devices do not have external communications as part of their normal operation, so this extra cabling and communication port is non-standard, and can cause the RF performance during test mode to be altered (as compared to the final performance that end users will experience). Dirty Packets – As part of receiver testing, the Bluetooth 4.x test standard defines RF packets that are intentionally distorted with non-ideal carrier frequency offsets, modulation index, and symbol timing errors. Although these are intended to simulate a “dirty transmitter,” realistically, no modern Bluetooth transmitter would ever have performance anywhere like this, so there is only limited correlation between “dirty packet” receiver performance and real-world receiver sensitivity. Test Packets – As part of transmitter testing, the device, in test mode, is set to transmit test packets with unique data patterns of alternating 1s and 0s, as well as long strings of 1s and 0s. Like dirty packets, these are unrealistic data patterns, and this type of test method is not representative of typical operation. Thus, it is insufficient to determine how the device might be expected to perform in a real-world application. Design testing provides the means of building the best possible product, and testing throughout the design cycle is critical to finding defects early and optimizing performance. Individual testing is performed on all major RF subsystems, such the chipset, RF filters, amplifiers, switches, and antennas. After each subsystem is optimized, the entire design is tested as a complete system. With thorough testing of subsystems, the final design stages can go quickly – avoiding major design changes and costly setbacks. As shown in Fig. 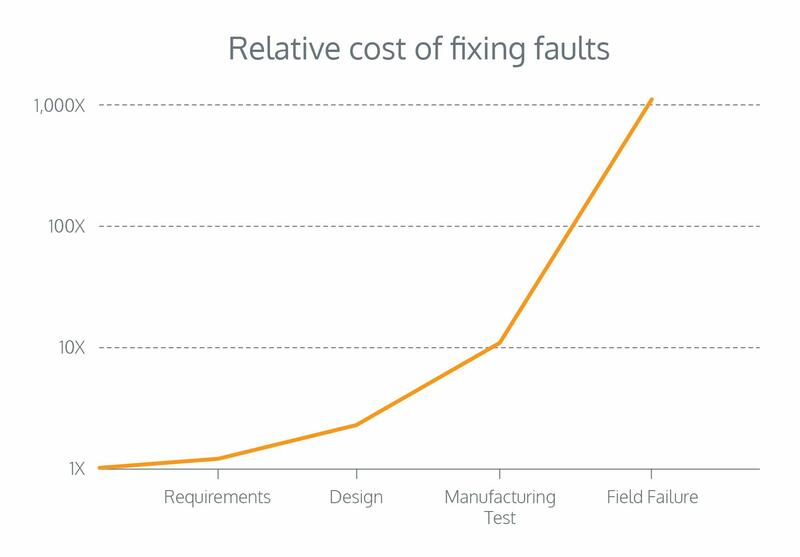 1, a design failure found late in the design lifecycle or during manufacturing test can be 10-100+ times more expensive to fix than an issue discovered and addressed during early design testing. Functional Testing – Ensures that all product hardware and software features, from the basic user interface to low-level encryption and security, operate correctly. Performance Testing – Includes measuring RF transmitter/receiver quality, confirming that sensors read and measure correctly, and ensuring battery life will meet design criteria. Conformance, Certification, And Regulatory Testing – The Bluetooth Special Interest Group (SIG) mandates that a product design pass SIG conformance testing in order to use the Bluetooth low energy brand mark. Conformance testing aims to ensure that product meets minimum Bluetooth low energy standards and is interoperable with other devices. Regulatory and certification testing often is driven by government regulation to ensure that the devices are safe, and that they will operate without excessive interference to/from other devices, including non-Bluetooth devices. While standardized design tests can ensure that the product meets minimum requirements for Bluetooth low energy and regulatory standards, they don’t ensure that real-world performance will meet customer needs for battery life, range, throughput, and other considerations. This is where OTA testing is used, because it more closely simulates how devices will be used in real applications. Currently available OTA solutions are fast, accurate, and very cost effective, and help to characterize your design in a way that matters to your end users. Testing is a critical part of the manufacturing process to ensure that customers do not receive DOAs or poorly performing products. A great design won’t matter if the device wasn’t manufactured correctly, and parametric measurements are the only method to ensure that marginal products, and not just hard failures, are identified. Manufacturing tests validate that the production process was performed properly and that critical components are meeting specifications. Manufacturing tests are less complex than design validation, since a proven software and hardware design can be assumed. This allows more streamlined testing, and often Bluetooth low energy devices can be tested and verified in a matter of seconds. Your customers use their devices with a wireless link, not a cabled connection, so whenever possible, test your device in a similar environment. OTA testing with a fully packaged device more accurately characterizes the actual user experience, because this validates the complete system performance, including the antenna and device enclosure. Critical performance metrics, such as transmitter output power and receiver sensitivity, directly impact range and throughput of the device, and OTA test equipment verifies these parameters in a manufacturing environment. Additionally, the simplicity of OTA testing means manufacturers can use the same test methods for returned products, allowing them to identify process issues in manufacturing or identify possible improvements to product design. While a concern with testing Bluetooth low energy products in manufacturing is ROI for equipment costs and testing time, modern OTA test systems are reasonably priced and can perform high confidence parametric testing in as little as 5-10 seconds per device, costing only pennies per unit. Ideally, this testing leads to quality improvements, driving more satisfied customers and lower returns, and resulting in an overall positive ROI for performing manufacturing testing. Bluetooth low energy is creating an entire new class of inexpensive and innovative wireless consumer-oriented devices. Consumers expect products that work well and consistently, and they have a low tolerance for poorly performing products. Thus, testing during both the design and manufacturing stages is essential to ensuring a well-designed and properly manufactured product that will be embraced by consumers. 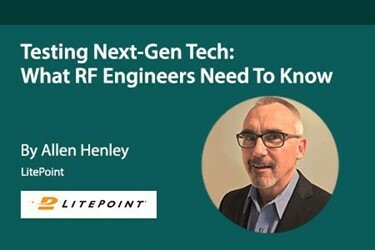 Allen Henley is senior product manager at LitePoint where he is responsible for cellular, Wi-Fi, Bluetooth and IoT test solutions. Prior to LitePoint, Allen held product management roles at Fluke, Agilent Technologies and Hewlett-Packard. He earned a BS in electrical engineering from California Polytechnic State University-San Luis Obispo and an MSEE from Washington State University. Allen is actively involved with his local school district STEM education programs to encourage high school students to pursue rewarding careers in engineering.